There isn't really any way to prepare one's heart for a horrific tragedy. In recent years, we have seen the horror of what one man can do, grow worse. We look at events like the U.S Postal Service Massacre (15 deaths), Virginia Tech Shooting (32 deaths), the Orlando shooting (49 deaths), Las Vegas (58 deaths) and we think how? Why? The truth is that anyone of these events is no more or less tragic than the next. The only difference is the proximity to our homes. People have said they never imagined such a thing could happen here, in Las Vegas. Stunned and unbelief barely touches the description of our immediate reactions. 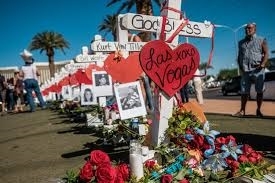 What became evident, at first slowly, then growing to the forefront of most news stories, was God's Almighty presence in Las Vegas that Sunday night. Few living outside of Vegas may never have expected to see this from "Sin City," until now… from victims talking about praying for God to save them, to an agnostic publicly testifying that he now knows for sure God exists, to another man confirming it is true that in situations like this, God's peace is present because he felt it, to prayer vigils on the steps of city hall and at many places across the valley (including at the famous 'Welcome to Las Vegas' sign), broadcast to the whole world, by all the major networks, to individuals selflessly sacrificing themselves for their fellow man, to the outpouring of support addressing the need for blood for the victims, to the mass amounts of financial contributions given for the support of the victims and their families, …God has made His presence in Las Vegas known! The motive is unknown and may never be known. Whatever it was, we know it was evil. Christ calls us to love our enemies and pray for those who persecute us. So we pray. We pray for those who suffer under the affliction of mental illness, we pray for those who have been deceived and used by Satan, we pray for the families of these perpetrators to find truth and peace in Salvation. Our hearts are heavy with the reality of the event. We pray for the peace that passes all understanding to come upon the survivors, first responders, medical personnel and the families of those who lost their lives. This has changed us. Our community has lost some of its 'normalcy' and although some will return over time, it will never be the same. There is sadness, grief and anger. However, there is also a little more patience and kindness. More concern for what our friends and neighbors might be going through. More situational awareness as we move through our daily lives. We have become stronger through this trial. We will take better care of each other and work to be God's light in this world. We appreciate the continued prayers of our greater CRC community keeping our community lifted up.